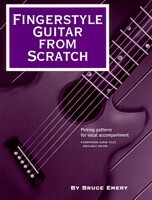 This book illustrates the basics of the Arpeggio Style and the Travis Style (alternating bass) forms of guitar vocal accompaniment. 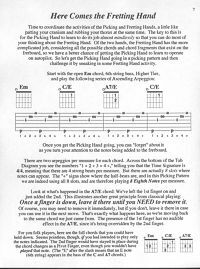 More specifically, you’ll be using your fingers to pick the individual notes out of common chords to backup your voice instead of strumming or picking those chords with a pick. It’s just a kinder, gentler way to play rhythm guitar. 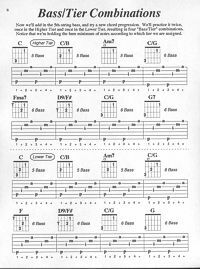 Think of “Dust in the Wind,” "Blackbird," “Scarborough Fair,” “Landslide,” “Leader of the Band” and “Time in a Bottle.” These are among the songs we’ll use to explore this style. 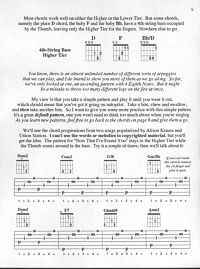 Learning the picking patterns themselves (presented in tablature, by the way) is fairly straightforward; the trick is in the coordination of the fretting and picking hands during the transitions from chord to chord. 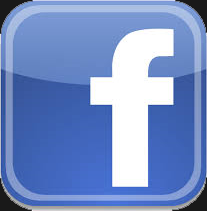 We'll cover a number of principles that help you navigate through these changes without losing the beat. 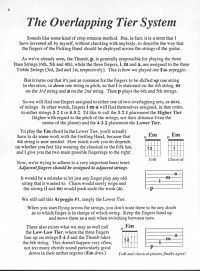 At the end of the book, you’ll see the 20 main arpeggios and the 20 main Travis patterns summarized for easy reference.